More than 40 members of Hampton University’s track team are safe after being caught in a bus fire on Saturday, WNCN/WAVY reported. The chartered bus carrying members of the Pirates from a competition in Columbia, S.C., went up in flames as it moved along the northbound lanes of Interstate 95 in Wilson County, N.C., the station said. Student athlete Khalil Gary told WTVD that the team lost everything that they had on the bus – from laptops to clothing. The incident started when team members began smelling smoke as they rode on the bus, Gary said. 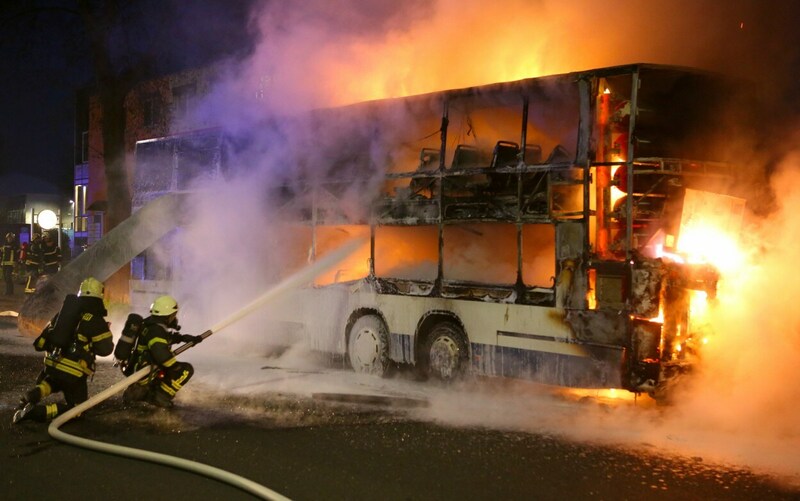 Within 10 minutes, the entire bus was on fire, he said. The driver transporting the HBCU team managed to evacuate all the team members on board before the bus was destroyed by the flames, Wilson County Emergency Management said in a news release quotes by WNCN/WAVY. The driver “did an excellent job,” according to the release. The team was taken to nearby Hunt High School in Wilson, where members waited until another bus picked them up to take them back to campus. Jim Heath, spokesman for Hampton University’s sports programs, issued a statement published by WNCN/WAVY. It took emergency responders about a half hour to put out the fire that involved 100 gallons of diesel fuel, Gordon Deno, emergency management director for Wilson County, said.